Even after nearly six years of making this website, I still get a thrill bringing you the next posting. And what a posting it is. Even as their countrymen lay starving in the cities and dying on the fields of battle in World War One, the Romanov’s still kept spending. Oh how the once mighty fell in a heap of their own making. But sometimes you just need a bit of dynastic, debauched (and beautiful) bling to brighten your capitalist day … and to remind you that nothing lasts forever and karma will always have its way. As a t-shirt in an op-shop that I saw today said, “Workers … possess the power.” And that is why governments, tyrants and despotic royalty will always be afraid of them. 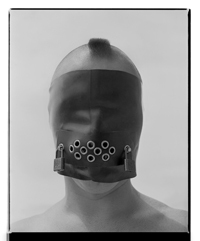 Many thankx to the Oklahoma City Museum of Art for allowing me to publish the photographs in the posting. Please click on the photographs for a larger version of the image. Virginia Museum of Fine Arts, Richmond. Bequest of Lillian Thomas Pratt. Pavel Ovchinnikov (1830-1888), Russian jeweller, silversmith, goldsmith, enameller, merchant, industrialist. Hallmark: П.О. or П.Овчинниковъ in a rectangle. 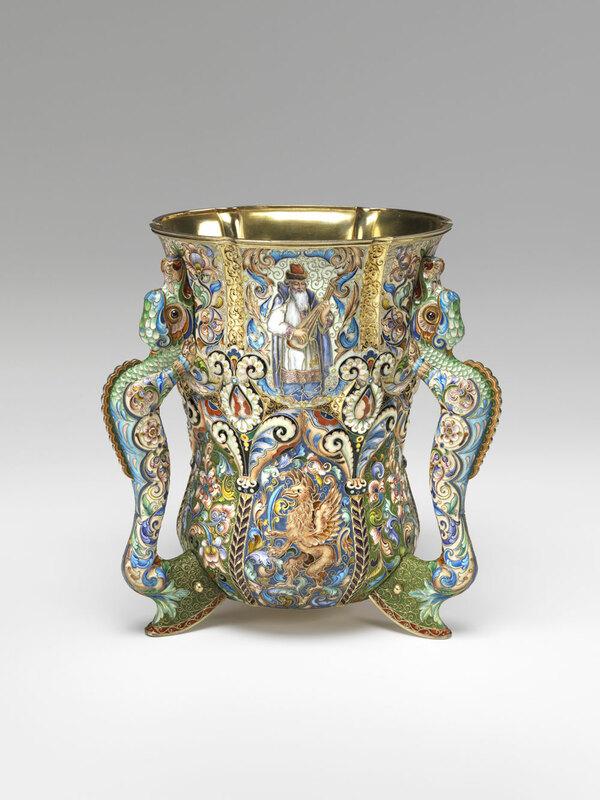 Trained in his brother’s workshop and opened a factory in Moscow, where he revived the art of enamelling and worked in the Neo-Russian style. Official purveyor to Tsar Alexander III, Grand Duke Mikhail Nikolaevich, King Victor Emmanuel II of Italy and King Christian IX of Denmark. Awarded the Légion d’honneur and the Order of the Iron Crown. Member of the Moscow City Duma. Alexander Yaroslavich Nevsky (Russian: Алекса́ндр Яросла́вич Не́вский; pronounced [ɐlʲɪˈksandr jɪrɐˈslavʲɪtɕ ˈnʲɛfskʲɪj] Ukrainian: Олександр Ярославович Не́вський); 13 May 1221 – 14 November 1263) served as Prince of Novgorod, Grand Prince of Kiev and Grand Prince of Vladimir during some of the most difficult times in Kievan Rus’ history. Commonly regarded as a key figure of medieval Rus’, Alexander – the grandson of Vsevolod the Big Nest – rose to legendary status on account of his military victories over German and Swedish invaders while agreeing to pay tribute to the powerful Golden Horde. He was proclaimed as a saint of the Russian Orthodox Church by Metropolite Macarius in 1547. Popular polls rank Alexander Nevsky as the greatest Russian hero in history. Upon the death of Hiskias Pendin in 1882, Carl Fabergé took sole responsibility for running the company. Carl was awarded the title Master Goldsmith, which permitted him to use his own hallmark in addition to that of the firm. 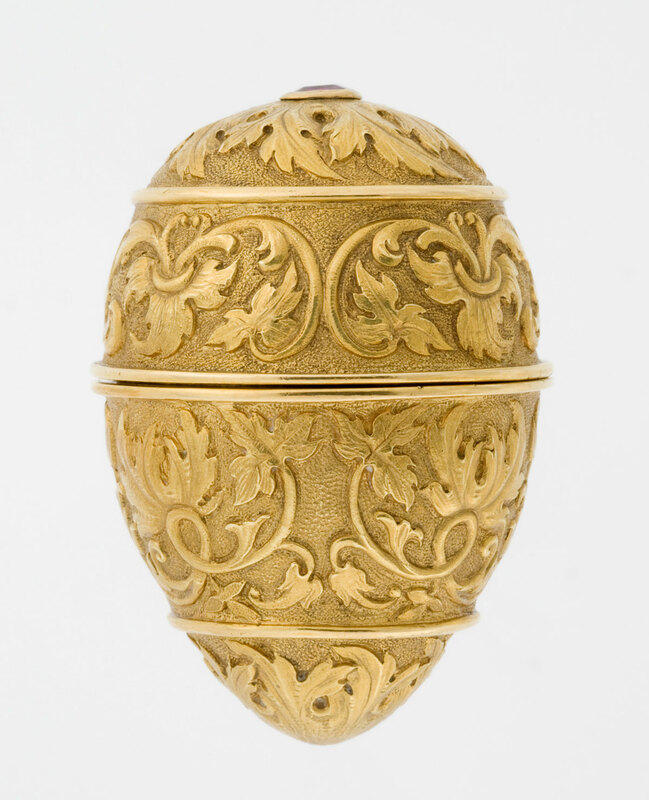 Carl Fabergé’s reputation was so high that the normal three-day examination was waived. For several years, Carl Faberge’s main assistant in the designing of jewellery was his younger brother, Agathon Faberge (1862-1895), who had also trained in Dresden. Carl and Agathon were a sensation at the Pan-Russian Exhibition held in Moscow in 1882. Carl was awarded a gold medal and the St. Stanisias Medal. One of the Fabergé pieces displayed was a replica of a 4th-century BC gold bangle from the Scythian Treasure in the Hermitage. The Tsar declared that he could not distinguish the Fabergé’s work from the original and ordered that objects by the House of Fabergé should be displayed in the Hermitage as examples of superb contemporary Russian craftsmanship. 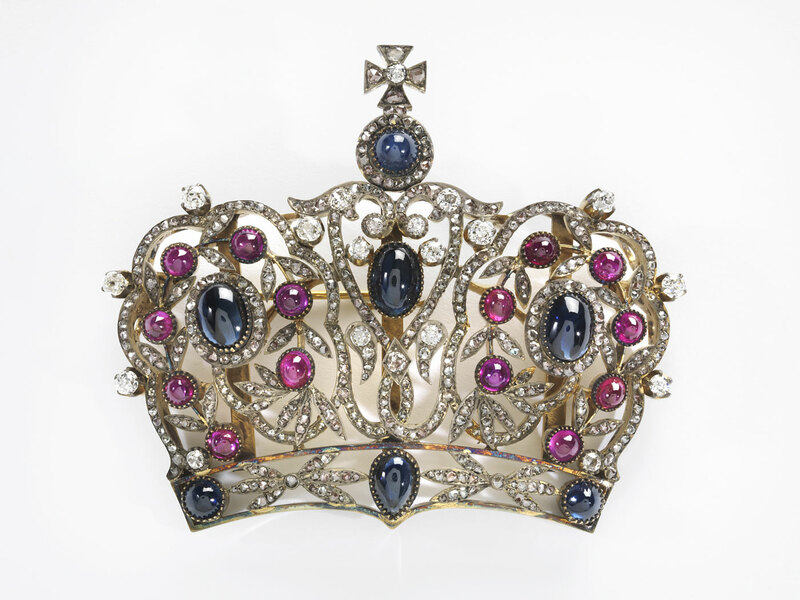 The House of Fabergé with its range of jewels was now within the focus of Russia’s Imperial Court. 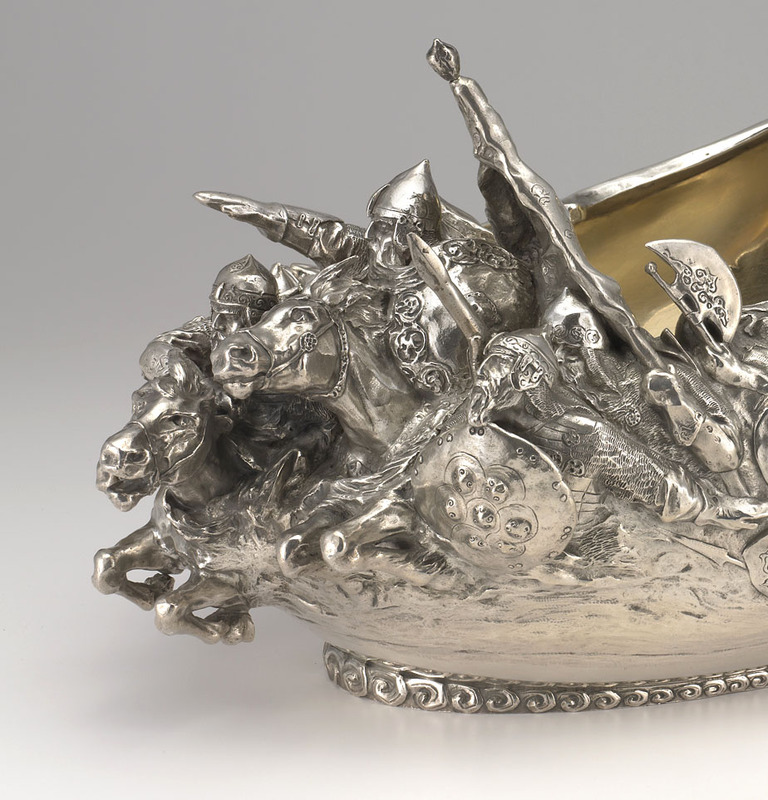 When Peter Carl took over the House, there was a move from producing jewellery in the then fashionable French 18th century style, to becoming artist-jewellers. 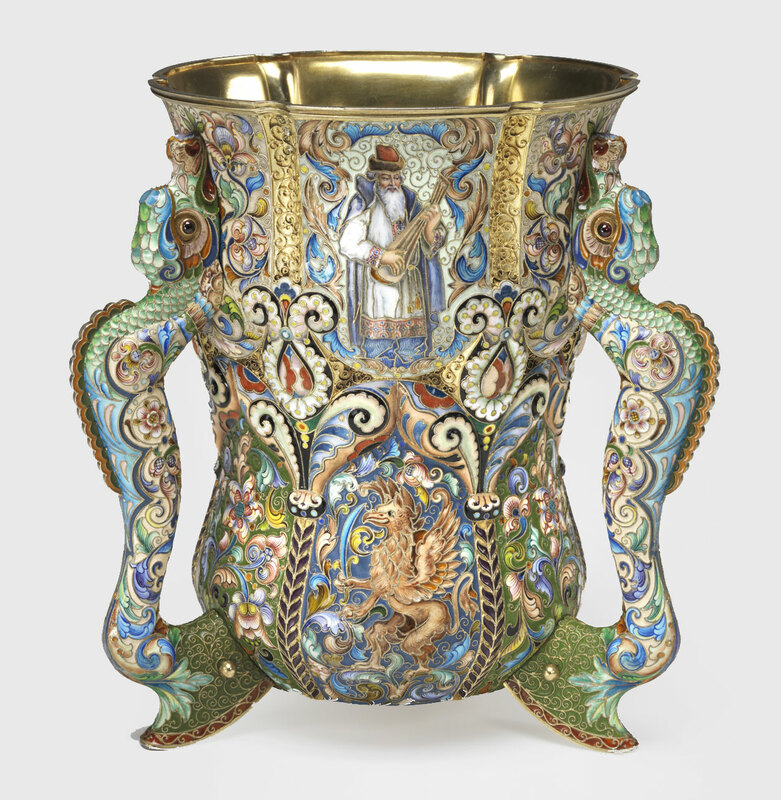 Having acquired the title of Supplier to the Court from Tsar Alexander III on May 1, 1885, Fabergé had full access to the important Hermitage Collection, where he was able not only to study but also to find inspiration for developing his unique style. Influenced by the jewelled bouquets created by the eighteenth century goldsmiths, Jean-Jacques Duval and Jérémie Pauzié, Fabergé re-worked their ideas, combining them with his accurate observations and fascination for Japanese art. 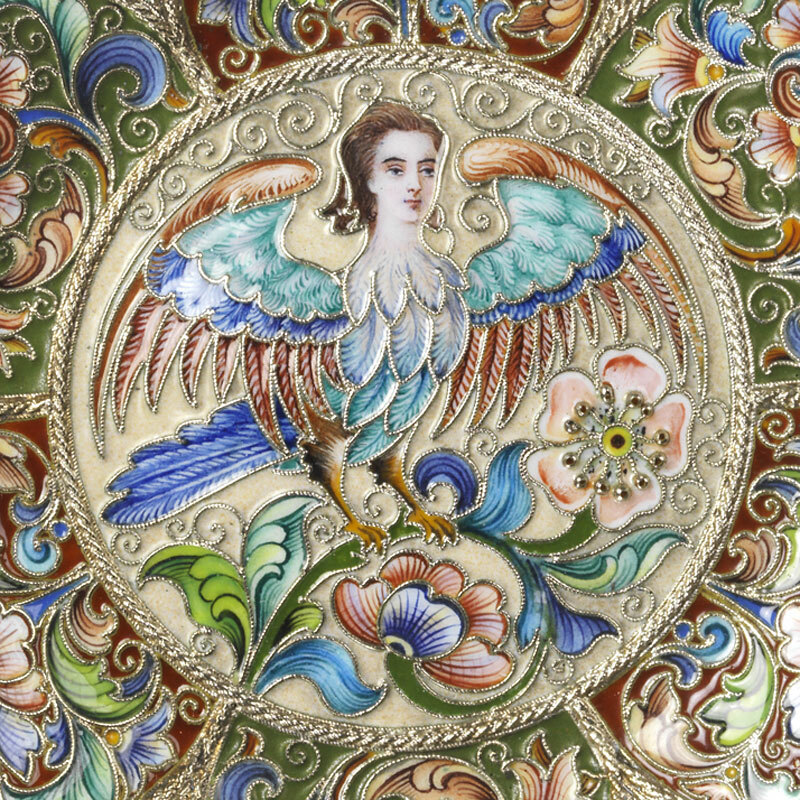 This resulted in reviving the lost art of enamelling and concentrating on setting every single stone in a piece to its best advantage. Indeed, it was not unusual for Agathon to make ten or more wax models so that all possibilities could be exhausted before deciding on a final design. 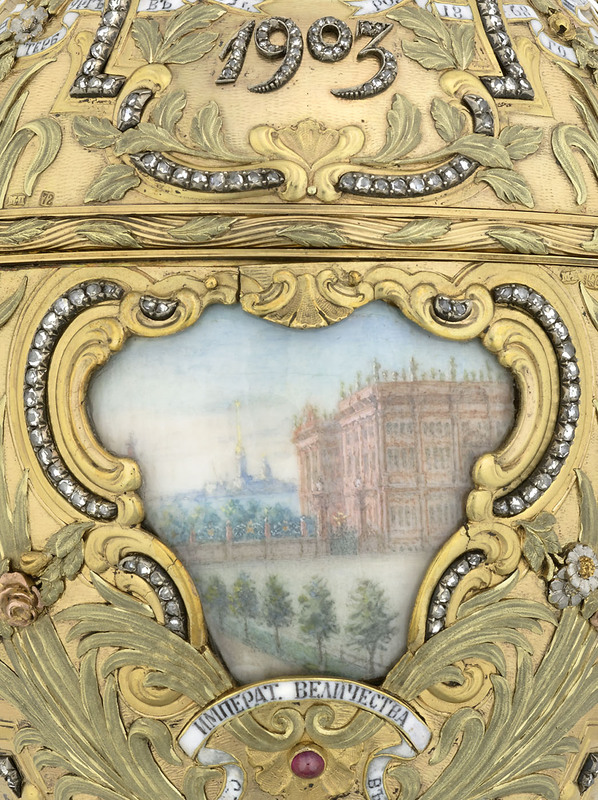 Shortly after Agathon joined the firm, the House introduced objects deluxe: gold bejewelled items embellished with enamel ranging from electric bell pushes to cigarette cases, including objects de fantaisie. In 1885, Tsar Alexander III gave the House of Fabergé the title; ‘Goldsmith by special appointment to the Imperial Crown’. The Kovsh is a traditional drinking vessel or ladle from Russia. It was oval-shaped like a boat with a single handle and may be shaped like a water bird or a norse longship. Originally the Kovsh made from wood and used to serve and drink mead, with specimens excavated from as early as the tenth century. 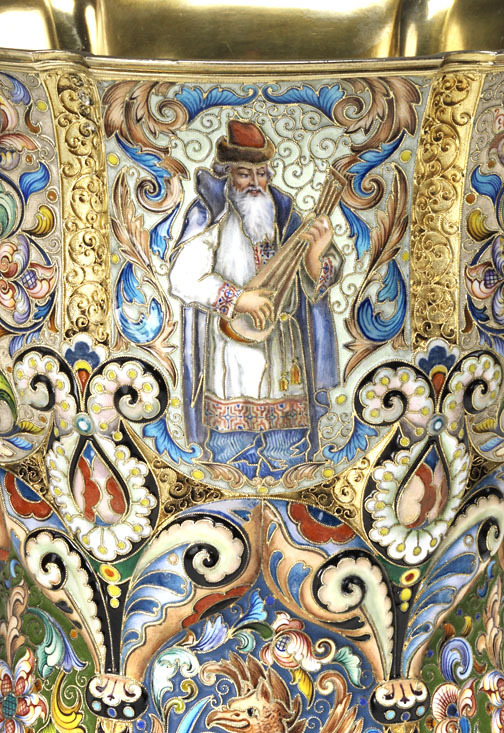 Metal Kovsh began to appear around the 14th century, although it also continued to be carved out of wood and was frequently brightly painted in peasant motifs. 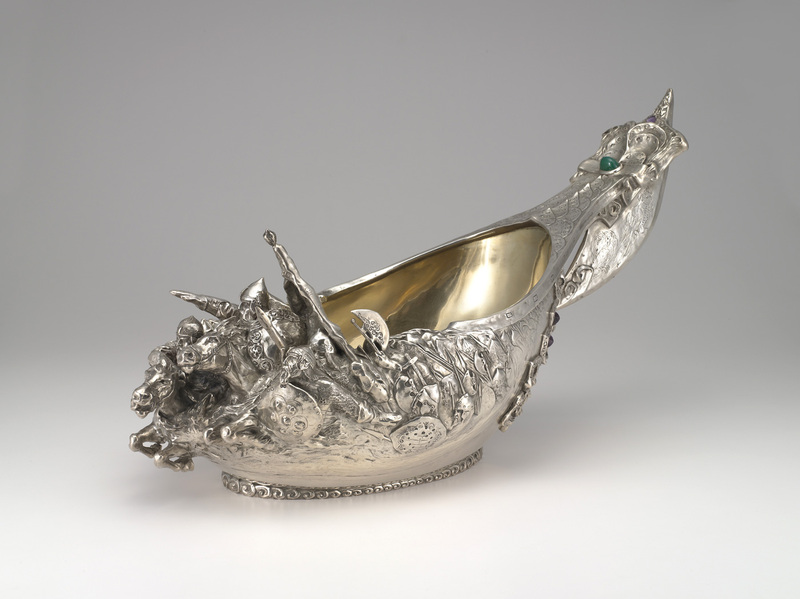 By the 17th century, the Kovsh was often an ornament rather than a practical vessel, and in the 19th century it was elaborately cast in precious metals for presentation as an official gift of the tsarist government. Feodor Ivanovich Rückert, Russian silver- and goldsmith of German origin, Fabergé workmaster. Born in Moscow in 1840. 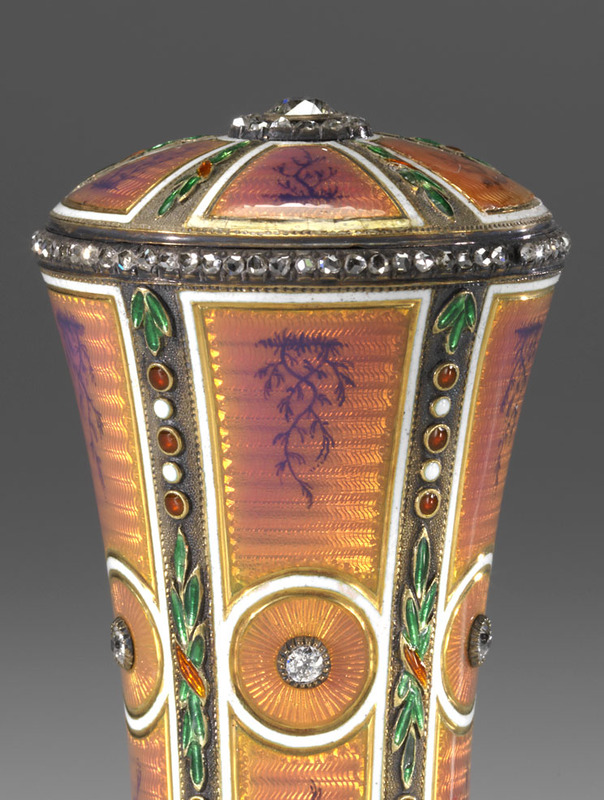 Worked with Carl Fabergé from 1887. His mark Ф.Р. (F.R. 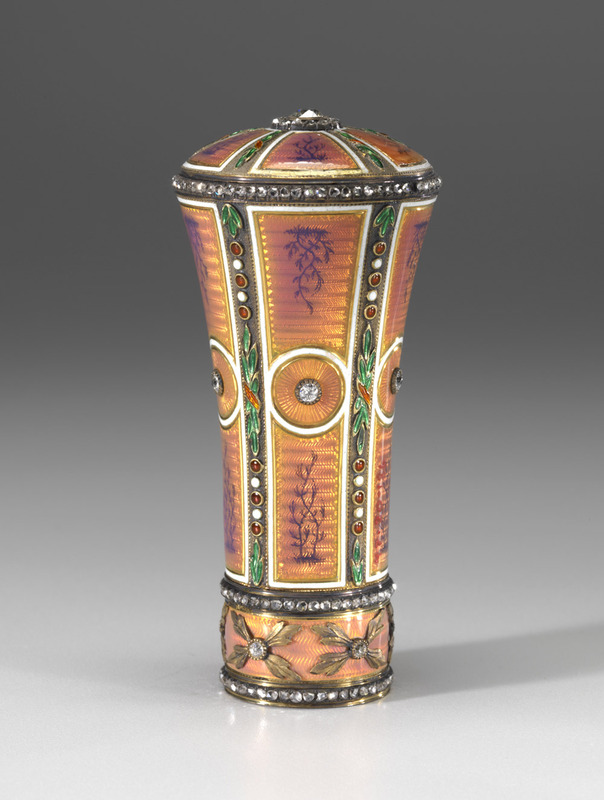 in Russian Cyrillic) can be found on cloisonné enamel objects made in Moscow, sold independently or by Fabergé. 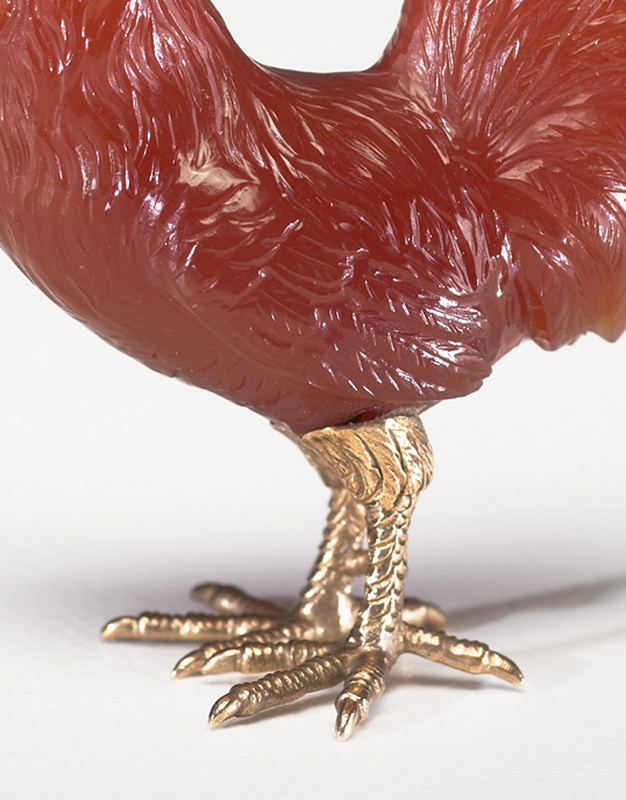 “More than 230 rare and storied treasures created by the House of Fabergé will be celebrated in a new exhibition at the Oklahoma City Museum of Art. 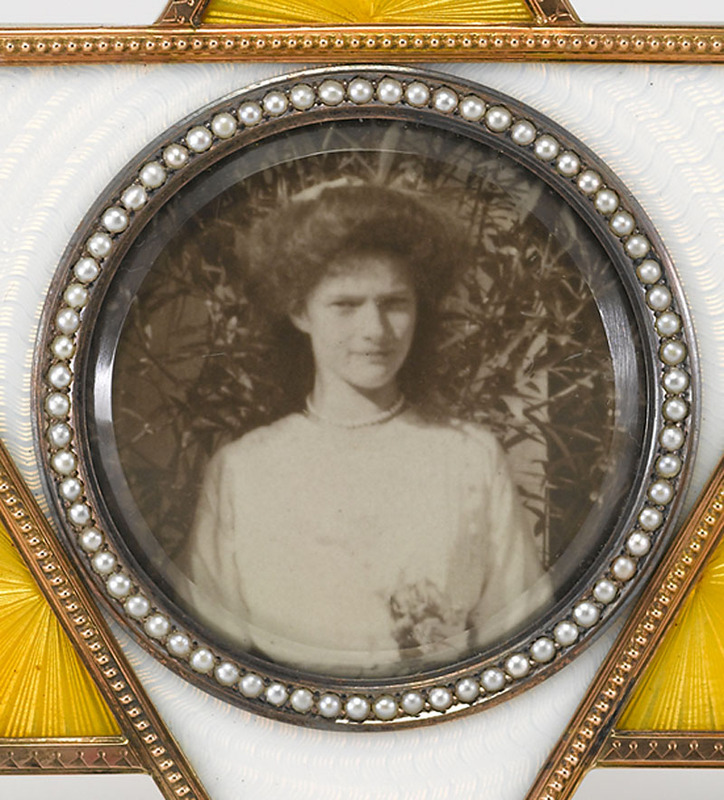 Fabergé: Jeweler to the Tsars will be on view from June 20 through September 27, 2015. 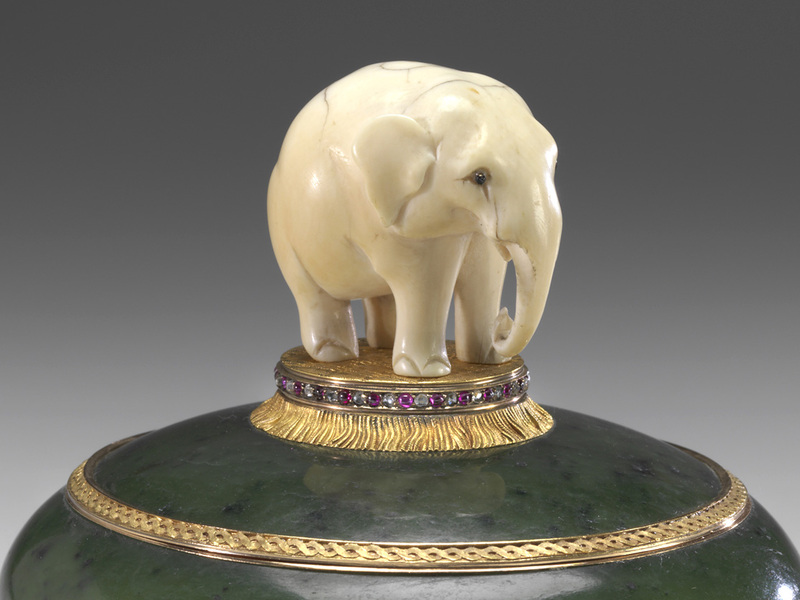 The exhibition, drawn from the Collection of the Virginia Museum of Fine Arts, Richmond, will showcase Karl Fabergé’s fine craftsmanship in pieces of jewelry and adornments once belonging to the Russian Imperial family. 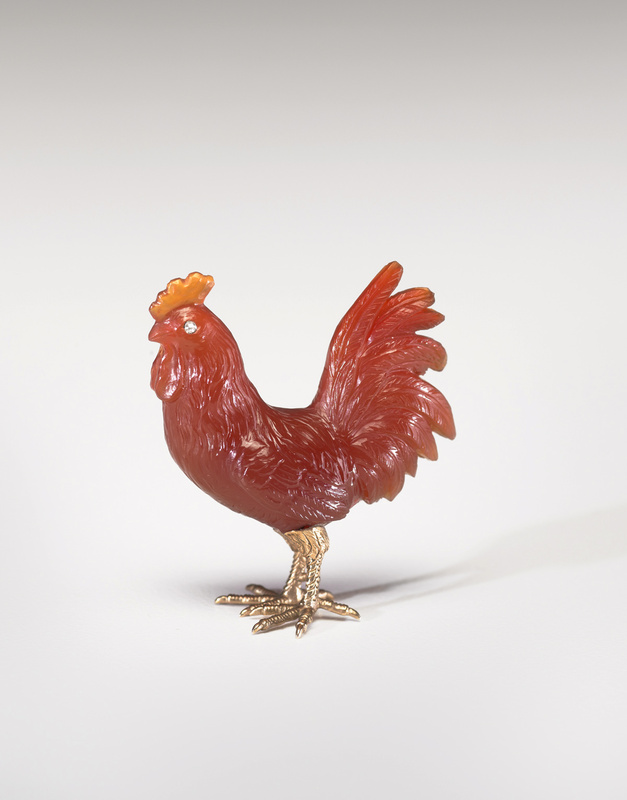 From dazzling Imperial Easter eggs to delicate flower ornaments and from enchanting animal sculptures to cigarette cases, photograph frames and desk clocks, Fabergé often turned the most mundane objects into miniature works of art. The vast majority of his designs were never repeated, and most pieces were made entirely by hand. The success of his business was inextricably linked to the patronage of the Romanov dynasty and the close ties among the British, Danish and Russian royal families, who often exchanged works by Fabergé as personal gifts. 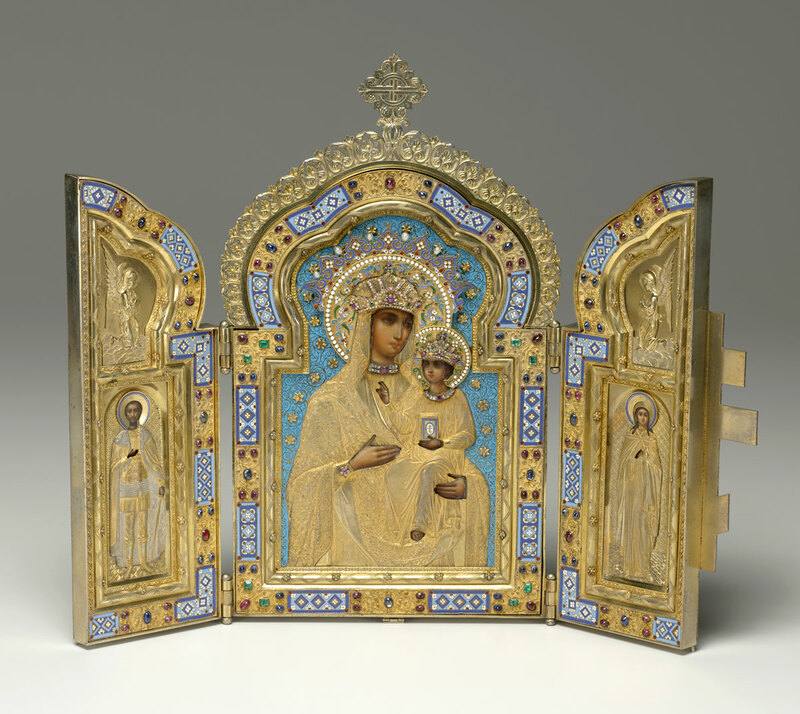 The Imperial Tsesarevich Easter Egg of 1912, which will be on view at OKCMOA, was a gift to Empress Alexandra from her husband, Emperor Nicholas II. The egg commemorates their son, Alexsei, who nearly died the previous year of hemophilia. For the shell, craftsmen joined six wedges of highly prized lapis lazuli and hid the seams with an elaborate gold filigree encasement. 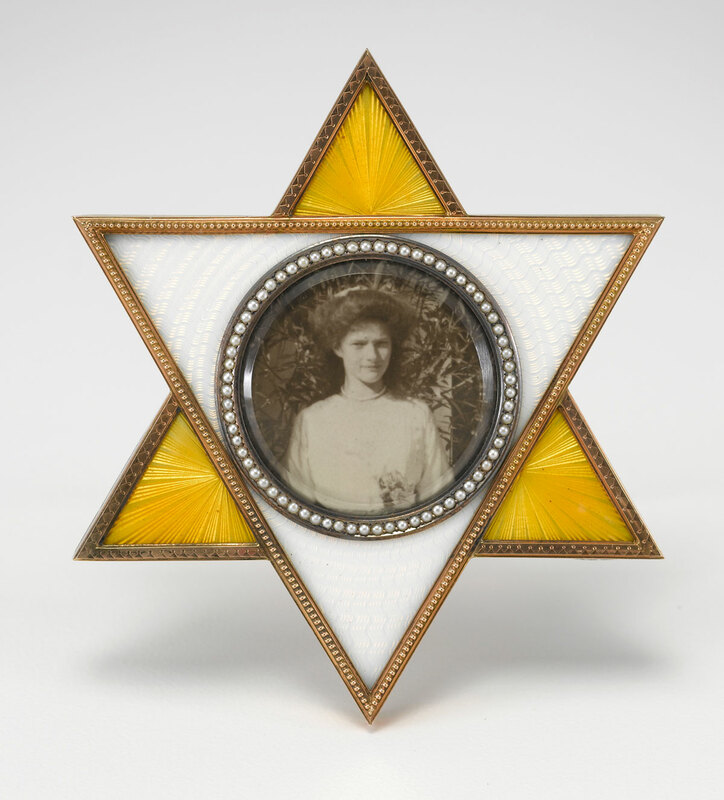 Inside the egg, a diamond encrusted Romanov family crest frames a two-sided portrait of the young child. These objects were associated with refinement and luxury because the House of Fabergé was known for accepting nothing less than perfection as well as for being business savvy. Beyond the elegant showrooms in Moscow and Saint Petersburg, hundreds of the country’s finest goldsmiths, enamellers, stone carvers, gem cutters and jewelers were at work creating innovative and complex designs that could not be readily imitated. 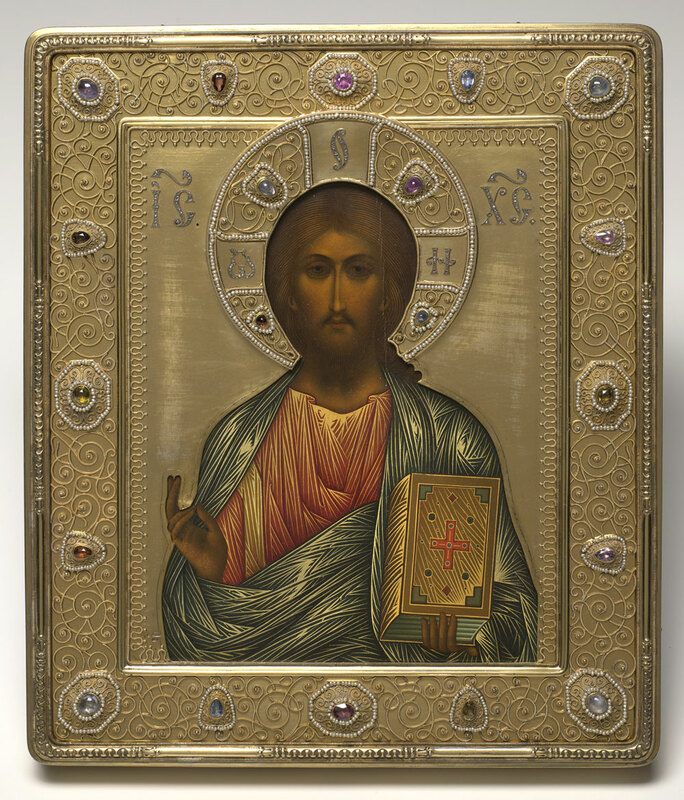 In Christian iconography, Christ Pantocrator refers to a specific depiction of Christ. Pantocrator or Pantokrator (Greek: Παντοκράτωρ) is, used in this context, a translation of one of many names of God in Judaism. When the Hebrew Bible was translated into Greek as the Septuagint, Pantokrator was used both for YHWH Sabaoth “Lord of Hosts” and for El Shaddai “God Almighty”. In the New Testament, Pantokrator is used once by Paul (2 Cor 6:18). Aside from that one occurrence, the author of the Book of Revelation is the only New Testament author to use the word Pantokrator. The author of Revelation uses the word nine times, and while the references to God and Christ in Revelation are at times interchangeable, Pantokrator appears to be reserved for God alone. 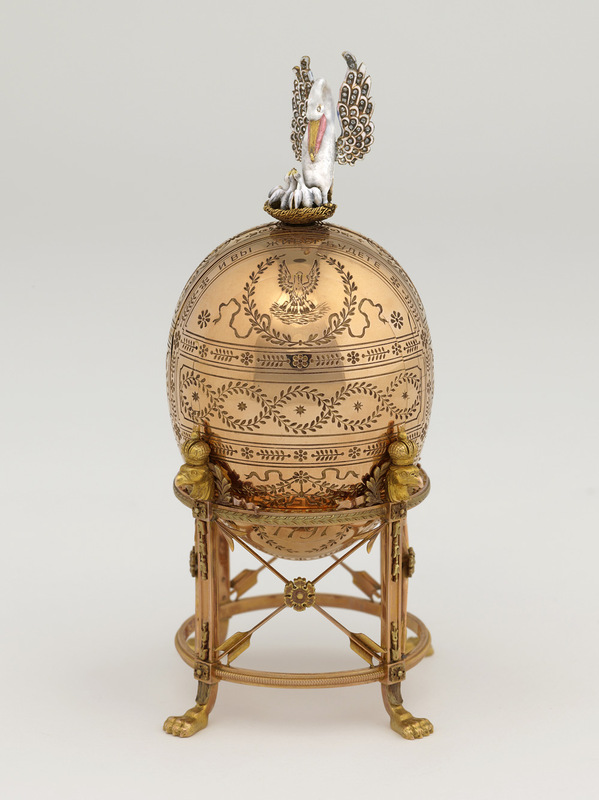 Peter, the Great Egg, is a jewelled Easter egg made under the supervision of the Russian jeweler Peter Carl Fabergé in 1903, for the last Tsar of Russia, Nicholas II. Tsar Nicholas presented the egg to his wife, the Czarina Alexandra Fyodorovna. 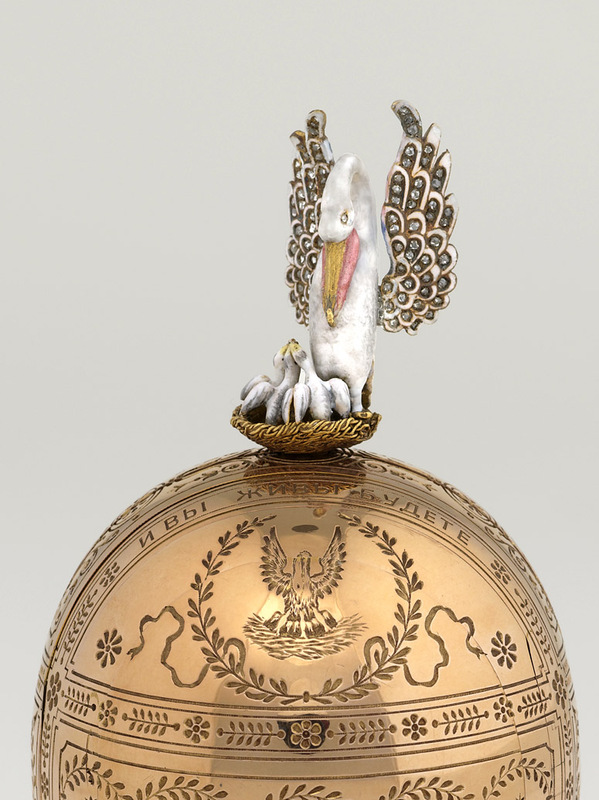 Made in the Rococo style, the Peter the Great Egg celebrated the two-hundredth anniversary of the founding of St. Petersburg in 1703. Executed in gold, the curves are set with diamonds and rubies. 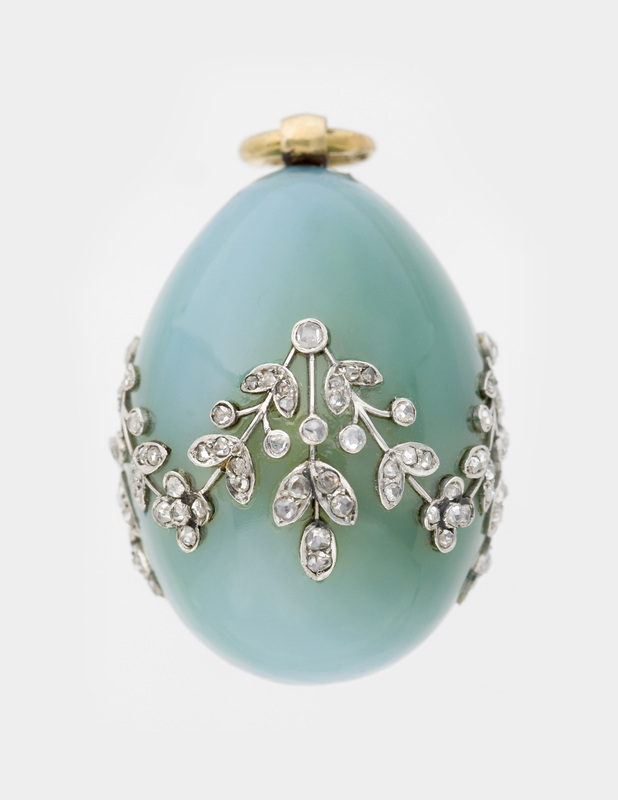 The body of the egg is covered in laurel leaves and bulrushes that are chased in 14-carat green gold. These symbolize the source of the “living waters”. The spikyheads are set with square rubies. 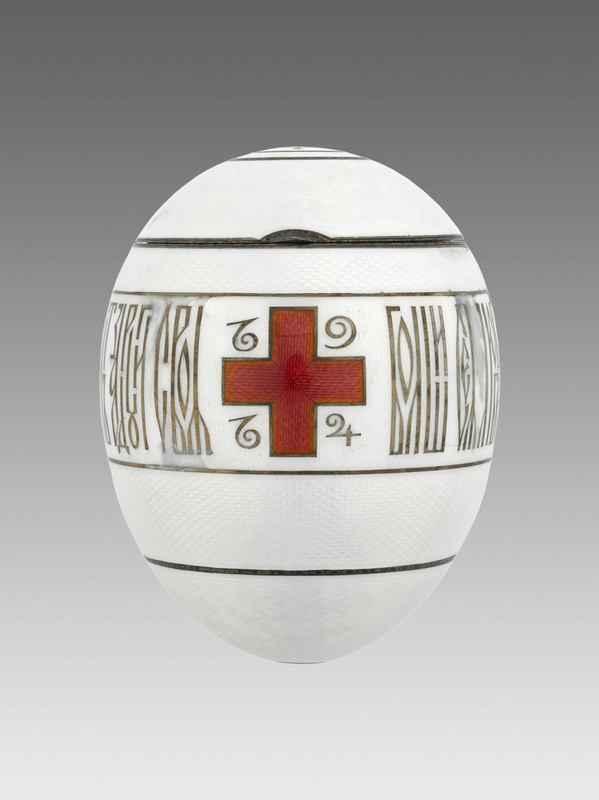 White enamel ribbons inscribed with historical details encircle the egg. 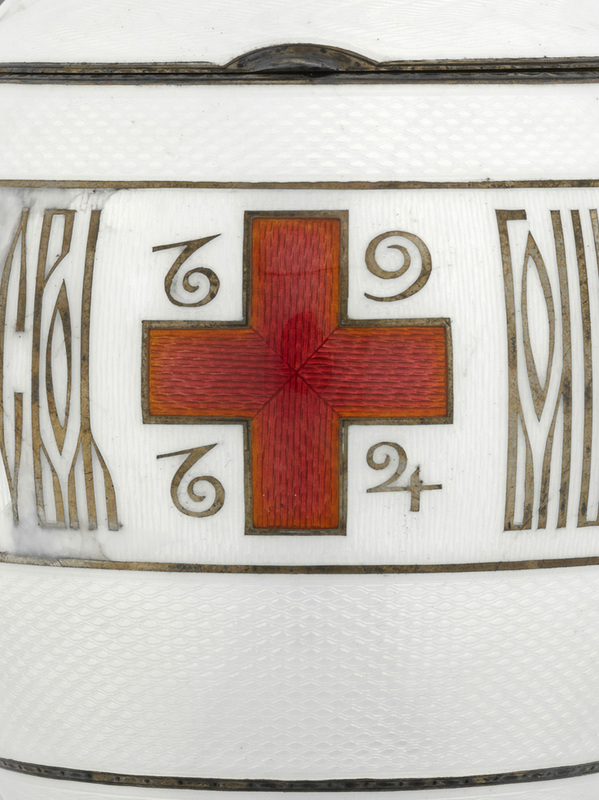 On the top of the egg is an enameled wreath which encircles Nicholas II’s monogram. The bottom of the egg is adorned with the double-headed imperial eagle, made of black enamel and crowned with two diamonds. The paintings representing the “before” and “after” of St. Petersburg in 1703 and 1903. The front painting features the extravagant Winter Palace, the official residence of Nicholas II two hundred years after the founding of St. Petersburg. Opposite this, on the back of the egg, is a painting of the log cabin believed to be built by Peter the Great himself, representative of the founding of St. Petersburg on the banks of the Neva River. On the sides of the egg are portraits of Peter the Great in 1703 and Nicholas II in 1903. Each of the miniatures is covered by rock crystal. The dates 1703 and 1903, worked in diamonds, appear on either side of the lid above the paintings of the log cabin and Winter Palace, respectively. 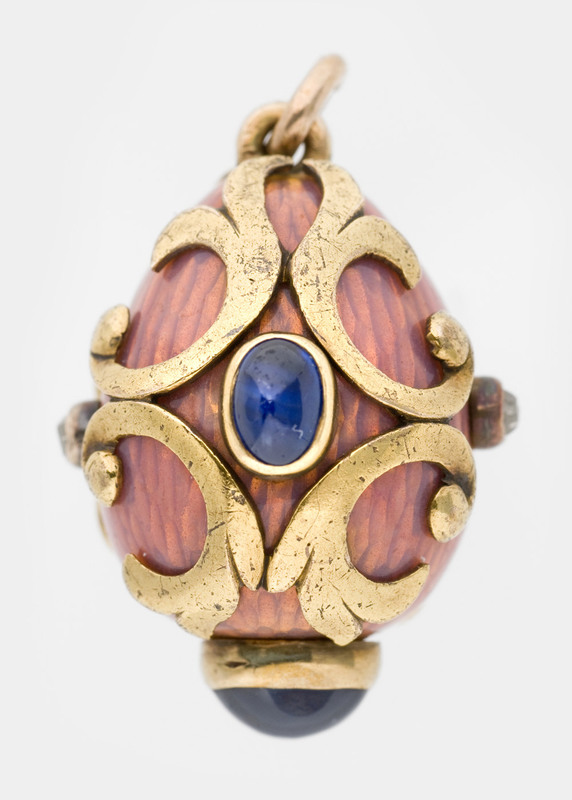 The surprise is that when the egg is opened, a mechanism within raises a miniature gold model of Peter the Great’s monument on the Neva, resting on a base of sapphire. The model was made by Gerogii Malychevin. The reason for this choice of surprise is the story of a legend from the 19th century that says enemy forces will never take St. Petersburg while the “Bronze Horseman” stands in the middle of the city. 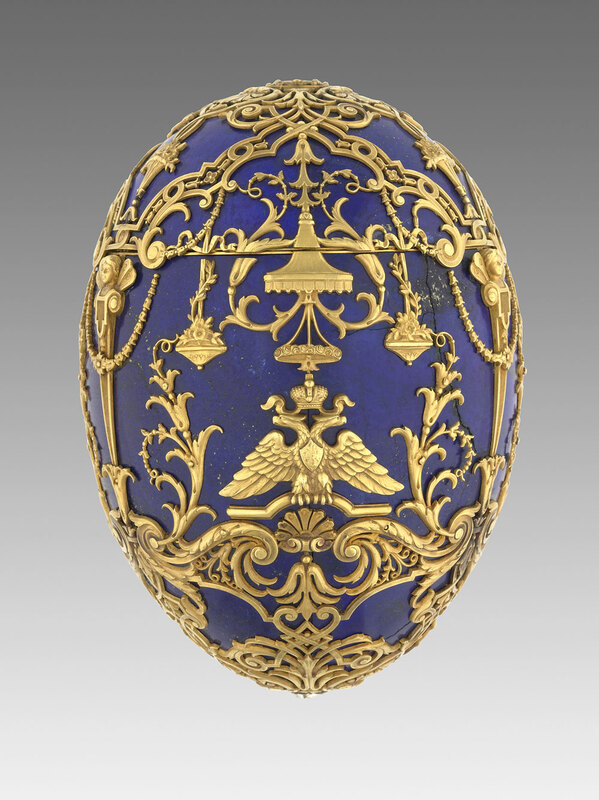 The Imperial Tsesarevich Easter Egg, created by workmaster Henrik Wigström, has six lapis lazuli segments with doubleheaded eagles, winged caryatids, hanging canopies, scrolls, flower baskets, and sprays that conceal the joints. It is set with a large solitaire diamond at the base, and a table diamond (a thin, flat diamond) on top over the Cyrillic monogram AF (for Alexandra Feodorovna) and the date 1912. 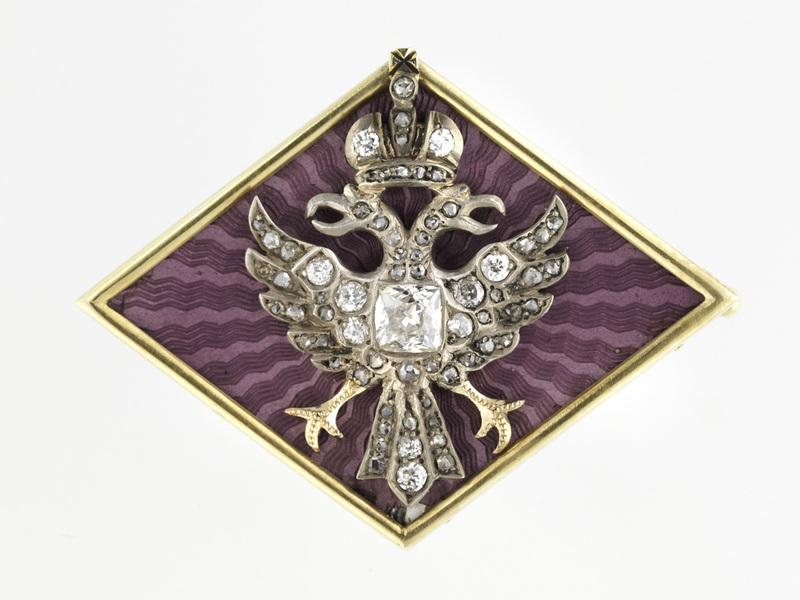 The surprise found inside is a portrait painted on ivory, front and back, of the tsesarevich in a diamond-set, double-headed eagle standing on a lapis lazuli pedestal. In addition to assisting Perkhin with 26 imperial eggs, Henrik Wigström produced 20 to 21 additional eggs between 1906 and 1916, including this masterpiece. Henrik Immanuel Wigström (1862-1923) was one of the most important Fabergé workmasters along with Michael Perchin. Perchin was the head workmaster from 1886 until his death in 1903, when he was succeeded by his chief assistant Henrik Wigstrom. These two workmasters were responsible for almost all the imperial Easter eggs. Once in Madsén’s employment, his master’s trade with Russia, as well as his numerous business contacts here, brought him to work in St. Petersburg. It is unknown who employed Wigström on his arrival in the capital, but Wigström became assistant in 1884, at the age of 22, to Perchin, whose shop at that time was already working exclusively for Fabergé. Wigström became head workmaster at Fabergé after Perchin’s death in 1903. The number of craftsmen in Wigström’s workshop diminished drastically with the outbreak of World War I. 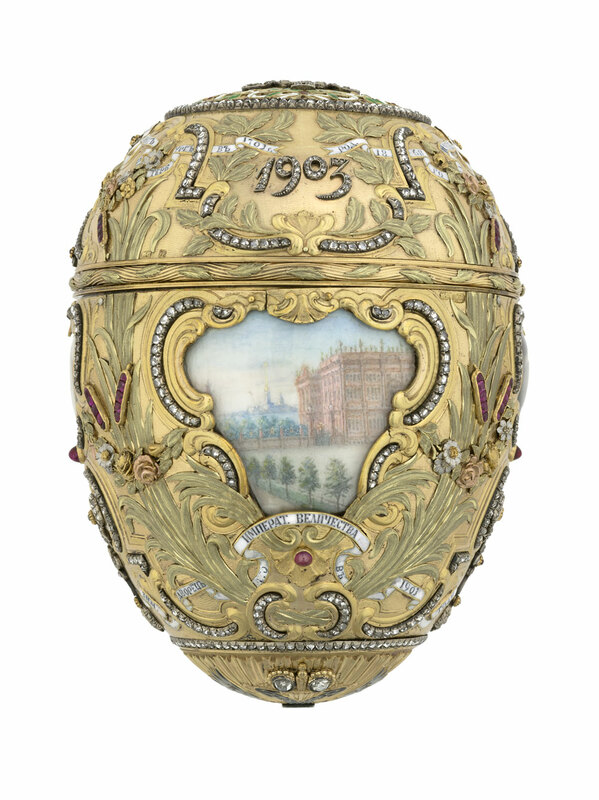 By 1918, the Revolution forced the complete closing of the House of Fabergé. Aged 56, Wigström retreated almost empty-handed to his summer house, on Finnish territory, and died there in 1923. His art is similar to Perchin’s but tends to be in the Louis XVI, Empire, or neo-classical style. 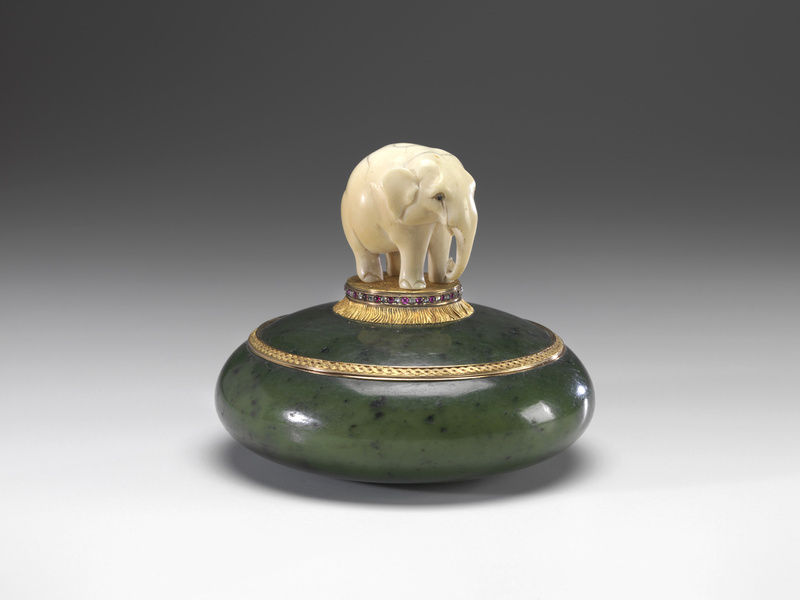 Nearly all the Fabergé hardstone animals, figures and flowers from that time period were produced under his supervision. Michael Evlampievich Perchin (Russian: Михаил Евлампьевич Перхин) (1860-1903) was born in Okulovskaya in Olonets Governorate (now Republic of Karelia) and died in St. Petersburg. He was one of the most important Fabergé workmasters along with Henrik Wigström. Perchin became the leading workmaster in the House of Fabergé in 1886 and supervised production of the eggs until his death in 1903. The eggs he was responsible for were marked with his initials. 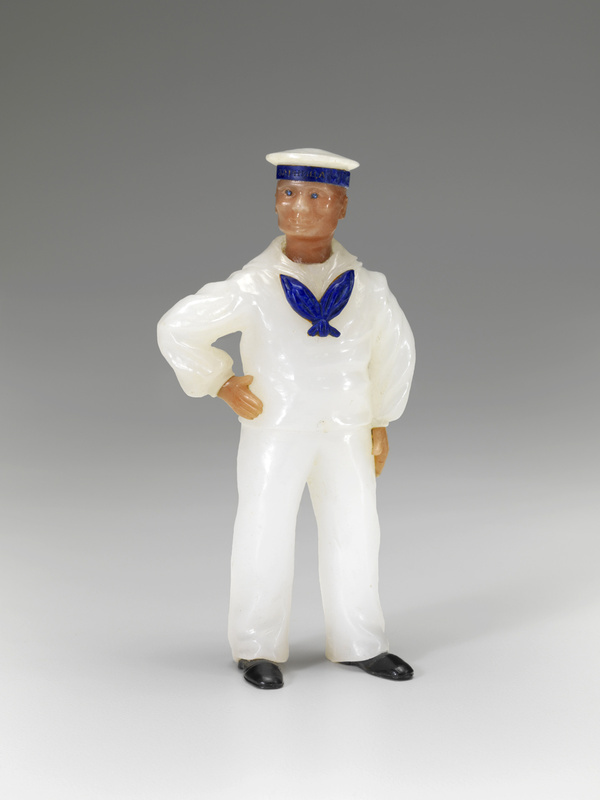 He worked initially as a journeyman in the workshop of Erik August Kollin. In 1884 he qualified as a master craftsman and his artistic potential must have been obvious to Fabergé who appointed him head workmaster in 1886. 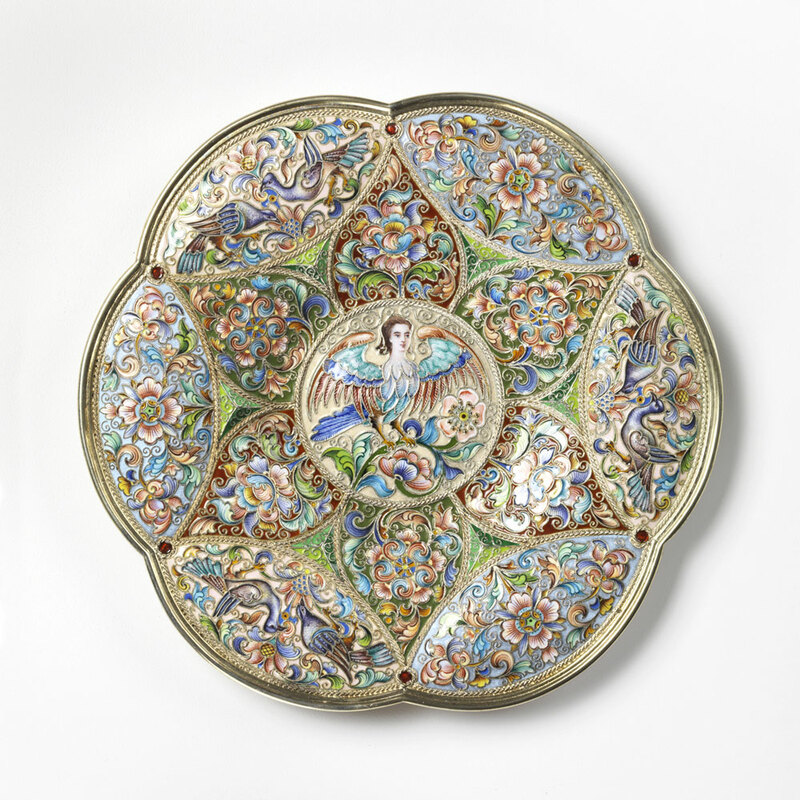 His workshop produced all types of objets de fantasie in gold, enamel and hard stones. All the important commissions of the time, including some of the Imperial Easter Eggs, the renowned “Fabergé eggs”, were made in his workshop. His period as head Fabergé workmaster is generally acknowledged to be the most artistically innovative, with a huge range of styles from neo-Rococo to Renaissance. Johannes Zehngraf (born April 18, 1857 in Nykøbing Falster, Denmark; † February 7, 1908 in Berlin) was a Danish painter of miniatures and chief miniaturist in the house of Carl Peter Fabergé in St. Petersburg. He was the son of painter and photographer Christian Antoni Zehngraf and Rebecca de Lemos and married on January 27, 1880 in Aalborg Caroline Ludovica Lund (* June 30, 1856; † after 1908), the daughter of Carl Ludvig Lund and Pouline Elisabeth Poulsen. The tapering, pentagonal parasol handle has panels of pink guilloché enamel painted with dendritic motifs within opaque-white enamel borders. A diamond is centered on each panel and Louis XVI-style floral decorations are set between the panels. Atop the handle is a brilliant-cut diamond finial in a rose-cut diamond surround with diamond-set fillets.